Here I post some screenshots of an app I make in qliksense to analyze all cards available in The Elder Scrolls Legends. It was quite challenging to work with the source sheet I found. Much modelling had to be done. I work with qlik and like it so much I used it to improve my fun. I created a very detailed model for attributes, decks, cards keywords and many inlines to get the colours and other static infos just right. If anybody shows interest, I can share it! Important Connector Update! We enhanced the Qlik Sense Cloud Business REST connector to improve security, performance, and user experience. As a result, your existing REST connections need to be reset or your REST connections will fail. Click here for updated instructions on how to set up a REST connection. Found a bug or a product related problem? You can open a case! Click this link to learn more - if you have experienced a problem with Qlik Sense Cloud:Found a bug or a product related problem? You can open a case! We are currently working on a fix for the same, and the fix will be deployed soon. Thank you for your patience! Github and Watson Connectors are not working as designed on QSCB. We are working on a fix and the same will be deployed soon! what could be the problem here.? Does anyone know if it is possible to combine Qlik Sense Cloud Business with Qlik Sense Enterprise? For example, deploy Qlik Sense Enterprise for 5 people who are stationed inside and deploy Qlik Sense Cloud Business for 10 people who are outside employees. This way you don't have buy 10 analyzer licences for the Enterprise version. But does this work together? And how do you manage your applications? And are there any other drawbacks? 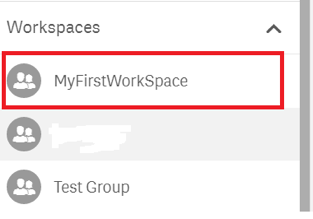 How can I invite members to my workspace in QSCB? In order to add users to your workspace, in accordance with the no of seats that you have purchased, please follow the following steps. 1.Select the check box under “Workspace” and you will see the Invited person in your workspace. "Como começar a usar Qlik Sense Cloud Business"
" Como Começar a usar o Qlik Sense Cloud Business"
- Como compartilhar com usuários. Será ótimo ter a sua participação neste webinar. 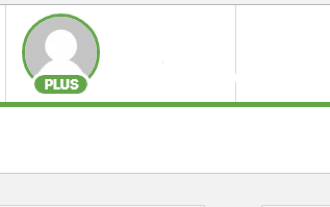 Se desejar, pode convidar seus amigos para conhecer a solução SaaS da Qlik! "Cómo Empezar a Utilizar Qlik Sense Cloud Business"
- Como compartir con usuarios. Su participación en ese webinar es muy importante. Si desear, quedase a gusto para invitar sus amigos para conocer la solución SaaS de Qlik! "Diferenças - Qlik Sense Cloud Business vs. Qlik Sense Enterprise"
"Diferenças: Qlik Sense Cloud Business vs. Qlik Sense Enterprise"
- Aprender sobre Qlik Sense Enterprise. Se desejar convidar seus amigos, sinta-se a vontade! "Diferencias - Qlik Sense Cloud Business vs. Qlik Sense Enterprise"
"Diferencias: Qlik Sense Cloud Business vs. Qlik Sense Enterprise"
- Aprender acerca Qlik Sense Enterprise. Si desea invitar sus amigos, quedase a gusto! "Entenda o Modelo Associativo de Dados da Qlik"
" Entenda o Modelo Associativo de Dados"
Confirme sua participação e convide seus amigos! "Compreenda el Modelo Asociativo de Datos de Qlik"
Beneficios de la Tecnologia Qlik. Confirme su participación y usted puede invitar sus amigos! "Usando Qlik Sense Cloud Business"
Por favor, confirme sua participação e convide seus amigos! "Conociendo Qlik Sense Cloud Business"
Por favor, hará bien en confirmar su participación y puede invitar sus amigos! Este é um espaço dedicado para clientes Qlik Sense Cloud Business. - Conhecer a proposta da Qlik. Participe e veja o que Qlik pode oferecer para o seu negócio. Ese es un momento dedicado para clientes Qlik Sense Cloud Business. - Conocer la propuesta de Qlik. Participe e vea lo que Qlik puede ofrecer para su business. What webinars would you like to see? Please leave us ideas in the comments below! "Getting Started with Qlik Sense Cloud Business"
- How to share with users. If you wish, you can invite your friends to learn about Qlik's SaaS solution! 02nd May "Understanding the Associative Model"
It will be great to have your participation in this webinar. If you wish, you can invite your friends to learn about Qlik's SaaS solution! 09th May "Getting Started with Qlik Sense Cloud Business"
Bring your questions about Qlik Sense Cloud Business. 23rd May "Difference - Qlik Sense Cloud Business vs. Qlik Sense Enterprise"
"Differences - Qlik Sense Cloud Business vs. Qlik Sense Enterprise"
- Learn about Qlik Sense Enterprise. 30th May "Getting Started with Qlik Sense Cloud Business"
Business – Group Owner Quick Reference Guide. A quick document on using EC2 to get a Windows 2003 server running for QVS. General overview of Qlik Sense, the free version of Qlik Sense Cloud and a demonstration of Qlik Sense Cloud Business followed by a live Q&A. Diferenças entre Qlik Sense Cloud Business vs. Qlik Sense Enterprise"
"Diferencias entre Qlik Sense Cloud Business vs. Qlik Sense Enterprise"
Será ótimo ter a sua participação neste webinar. Se desejar, pode convidar seus amigos para conhecer a solução SaaS da Qlik! A Qlik convida você a participar do webinar: "Usando Qlik Sense Cloud Business". Qlik invita a usted a participar del webinar: "Conociendo Qlik Sense Cloud Business". Are you looking for a quick, easy and low-cost visual analytics solution for your organization? Do you want to use data to find insights for operational, sales and financial improvement? "Entenda o Modelo Associativo de Dados - Qlik"
"Compreenda el Modelo Associativo de Datos de Qlik"
Confirme su participación y usted puede invitar sus amigos!" "Entenda o Modelo Associativo da Qlik"
"Compreenda el Modelo Asociativo de Qlik"
28th February "Getting Started with Qlik Sense Cloud Business"
07th March "Understanding the Associative Model"
21st March "Getting Started with Qlik Sense Cloud Business"
28th March "Understanding the Associative Model"
Where can i find out how much of my storage quota I have used in QlikCloud? Currently there are two areas where a cloud user can locate their storage quota. For free and plus users they need only check the personal storage area. 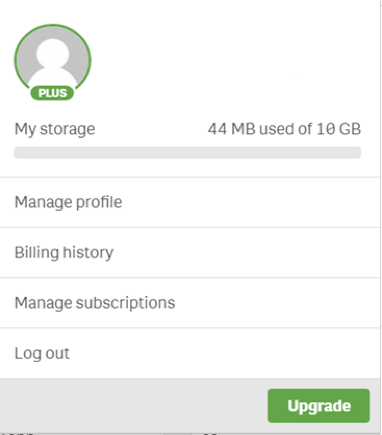 For business users there is a group storage quota as well. Below are directions on how to find each quota space.